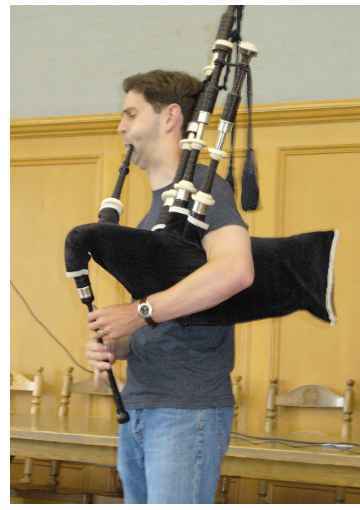 When piper James MacHattie’s name first started to appear in the prize lists online and in various North American and Scottish piping journals, I was intrigued. My mother, you see, was a MacHattie from Loch Katrine, Antigonish County, and the name is not a common one. Most if not all of the MacHatties in Nova Scotia are descended from one of three sons of the same pioneer family. Could a MacHattie from Saskatoon be connected? This past July, I had the opportunity to find out when I taught with James at the Ontario School of Piping. The night I arrived at St. Andrews College in Aurora, I spoke to him about his MacHattie roots. "Nova Scotia," he said, "but they originally came from a little farmstead called Stockley near Dufftown, Banffshire, in Scotland." There was no doubt about it. We were cousins. Another piper in the family! James Alexander MacHattie was born Frobisher Bay, on Baffin Island in the Northwest Territories (now Iqualuit, Nunivut) in 1974. "My parents were not long out of university," James explains. "Mum was a doctor and she took a position there for a year." When James was about six months old, the family moved to Leaf Rapids, near Thompson, Manitoba, and then on to Marathon, on the north shore of Lake Superior. James picks up the story. "When I was five years old, my parents decided to move the family into the boreal forest of Northern Saskatchewan, to a lake north of Le Ronge with the nearest road about twenty kilometres away. My father went ahead and set the foundations for the house, and then the family moved up there. We spent the first summer under a tarp, slowly building a log house, which we never actually finished in the seven years we lived there. We didn’t get electricity until the last year, and we never got running water. "My sister and I took correspondence lessons with Mum and Dad helping out. Mum was the math whiz and Dad helped out with geography, writing and that sort of stuff from September to about May each year. Our lessons were intense, very concentrated for three hours each day. In the summer, we spent as much time as we could out in the forest, but in the winter we read a great deal. We read Arthur Ransome, C.S. Lewis, Robert Louis Stevenson – books like Swallows and Amazons, Watership Down and so forth, all the children’s classics. My sister Edith and I got into reading above our level simply because we did so much of it." Although they were isolated from the rest of the world for much of the year, they weren’t lonely. "The family across the lake had two daughters," James explains, "and another family just to the south of us had a daughter as well so there were five children on the lake at that time. I happened to have been the only boy but, at that age, it didn’t matter. We were always out playing with sticks, and rafts, and things like that. My dad played guitar and banjo, and piano, and my mother played the Autoharp. The people on the lake south of us both played violin with the Saskatoon symphony orchestra before they moved up north, so we would have great sessions playing music and singing, mostly folk music, a little Celtic. My parents taught us recorder so we read and played music from an early age. "At least once a year we would come out for about a full month to visit grandparents in Toronto and Ottawa. We always looked forward to playing with our cousins. The only way to get back to our place in the winter was to cross country ski in, or to fly in on an airplane that could land on the frozen lake on skis. In summer, it was either canoe and portage your way in or take a floatplane." In 1987, when James was twelve, his family moved south to Saskatoon where he entered school in the eighth grade. "That was a real shock," James remembers. "Edith and I were both outgoing kids, but that ended when we got into public school. There were about twenty-five students in my class, and they all knew about me being brought up in the boreal forest and so on, and they were interested in all that. I didn’t know a lot of things – how to give ‘high fives’, or play volleyball, or basketball, but the kids in my class wanted to show me how to do everything. It wasn’t so easy for Edith, but by the end of high school, she had made a lot of friends too. "I started piping that same year. The 78th Frasers from Toronto had just won the World Pipe Band Championship, and from the very beginning I wanted to become good enough to play in that band. Bruce Gandy played a solo on their CD that I loved and he was sort of my hero. He came out to judge at the Saskatoon Highland Games and after that he became my idol. "The Saskatoon Boys Optimist Pipe Band advertised for students to start their instructional program. As a child I had told my parents that I wanted to play bagpipes. Dad remembered this and signed me up. I started off with an old army piper named Hugh Fraser. I moved fairly quickly and ended up in the junior band. I think that perhaps I made that transition too soon as I started crushing doublings and things like that in an attempt to play fast enough to keep up with the band, which was led by Gordon Findlater. He and Hugh Fraser really set the foundation for my playing." Soon after, James started taking lessons from Dayle West who introduced him to solo competing and what it takes to be a competitive piper. "He pushed me harder and that was what it took to really get me going," says James. "We had our good seasons and we had our bad seasons as the band grew. It was a fairly good group, with good players coming out of it. Danielle Brin, for example, is one. She has been playing with the Simon Fraser University Pipe Band since 1995. "After a couple of years with the kids’ band, I started playing with the local Grade 2 band. At the same time, I started to play with Neil Dickie’s Grade 1 Edmonton Caledonia Pipe Band and played in two World Championships with them. I was worried that Neil might have thought I was a cocky young piper from Saskatchewan, and was joining the band only because they were going to Scotland, but that wasn’t really the case. I asked him for some piobaireachd lessons but he didn’t feel comfortable doing that. Instead, he passed me some tapes that were a help to me at that time. "When we finished high school, a bunch of us decided to move out to BC. We had been attending the summer schools at Coeur D’Alene in Idaho and had met a lot of the west coast pipers there, Jamie Troy, Alan Walters, etc. I joined Jamie’s City of Victoria Pipe Band but I stayed there only for one year. I also took private lessons from Alan Bevan, and he and I joined the SFU band together in the fall of 1995, just after the band’s first win at the World’s. There we came under the influence of Terry and Jack Lee. I stayed with the band through to 2000, and during that time we won two more World Championships." James’ first trip to Scotland with SFU was in 1996. "What a strange year that was," James recalls. "The SFU band was the reigning World Champion. After all the bands had played, there was a lot of apprehension leading up to the announcement but when it came, there we were, champions once again. It was incredible. "The win that I will never forget, however, came in 1999. My fiancé Kylie Macintosh was on that trip playing with the Abbotsford Police. Her younger twin sisters were playing in the Robert Malcolm Memorial Pipe Band, and I was one of the instructors of that group. SFU won the Grade 1 event and Robert Malcolm Memorial won the juvenile section. What an incredible feeling! It was almost like winning twice on the same day!" While in BC, James studied at UBC acquiring both a Bachelor’s Degree and a Master’s Degree in Classical Studies. 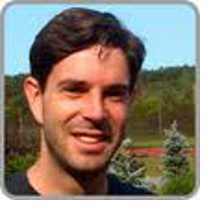 In the fall of 2000, he transferred to the University of Toronto to study for his doctorate, and is now entering his fourth and final year there. When he came east, it was anticipated that he would play with the 78th Fraser Highlanders, but that is not what happened. "If you had asked me when I first started if I would have jumped at a chance to play with the 78ths, I would have said yes, but over the years I had come to know Iain MacDonald and respected him as an individual and as a player. His Toronto Police Pipe Band was in a re-building stage and Kylie and I thought we could bring something to help with that. It’s been a great experience, first of all because Kylie and I are there together, and secondly because it is terrific to play in a band that, year after year, is making steps forward. It’s not that long ago that the band was playing in Grade 2 and now we’re a competent Grade 1 band." In terms of solo playing, Dayle West got James started and instilled a work ethic that has carried him over the years. "What really made the difference, though," says James, "was attending summer schools. Andrew Wright would come from Scotland and I would have a chance to study piobaireachd with him, which lit a bit of a spark. Alan Walters got us playing the fun stuff – hornpipes, jigs, etc., and Jamie Troy got us into the heavy marches, strathspeys and reels. When I moved out to Vancouver, I got hooked up with Alan Bevan. I was a Grade 1 player by then, but not getting any further. After a year with him in which I did really well in the Grade 1 solos, I moved up to Open. Alan got me over that hump. I had been on a plateau, I guess, and needed a push. I had some lessons with Jack Lee, but most of my progress was as a result of working with Alan Bevan." James benefited from playing in the SFU Pipe Band as well. Pipe Major Terry Lee’s analytical approach coupled with his brother Jack’s emphasis on expression and phrasing helped him in preparing his solo pieces. The first year in Toronto, however, was one of major adjustments. James continued practicing mostly on his own, with some input from Alan Bevan when he was here, but then he approached Bill Livingstone and asked if he would be willing to take him on. "Since then," James continues, "I’ve been going to him. He has a way of explaining things about piobaireachd that has made me much more confident about my playing that I ever was before." James has a long list of competitive awards to his credit. For example, he won the BC Pipers’ Knockout Competition, and later placed first in the "B" Marches and second in the Silver Medal in Inverness, Scotland. He also won the Marches at the Royal Braemar Highland Games. In 2002 he won the light music at the Livingstone Invitational and followed that up with the Gold Medal for Piobaireachd and a first in the MSR at Maxville. Before our interview in early July of 2003, he had won the Cameron-Gillies Banner at the Dan Reid Memorial Competition in San Francisco. "I compete in Scotland regularly," says James. "I was invited to play in the Gold Medal the year after taking the second prize at Inverness. I played a fairly good tune, but didn’t place. I’ll go back and try for the Silver Medal and the "A" Light Music again this year, and I will persevere for as long as it takes, I think. My goal is to play well, play the best I can. Whether or not I win the Medal is out of my hands, but I’d rather proceed on to the Gold Medal events with the Silver Medal behind me instead of getting into the Gold based on high placings." James composes music, but is very picky about what he gives out. "A lot of my attempts end up in the garbage," he says. "About one in five pieces comes out for public scrutiny, and that’s usually with a bit of prompting. Themes for tunes will pop into my head at the strangest times and I’ll scribble them down on a piece of paper. Later, when I want to try to work on them, I’ll search frantically for the bits of paper. There are scraps like that all over the house. SFU played a couple of my tunes in their medley in 2000, and the waltz arrangement of "Rocking the Baby" at the end of the ’99 medley was mine. I have a number of tunes published in Colin Magee’s book. If people like a tune I play, I’ll pass it on, but I don’t make a big issue of getting my tunes out." James played with SFU on their recordings "Live In America" recorded in Chicago and "Live At Carneigie Hall" recorded in New York. "The recording of our concert at Carnegie Hall went better than we had hoped. The tone is quite well sustained all the way through. As you first march onto that stage, your nerves are on edge, and the adrenalin is pumping, but once you get going, you start to have fun and it was a great time. Neil Dickie was a tremendous MC, and had the audience psyched up for our performances." James has also done some teaching. "I take private students, and I’ve taught for a few years at Piping Hot Summer Drummer, near Vernon, BC which is a summer school organized by Reid Maxwell and Jack Lee. A lot of my teaching experience came from working with the Robert Malcolm Memorial band. I learned a lot about what to expect and how to work with kids. I learned how to set chanters just by working with the kids’ band, and I use that experience now setting up the Toronto Police band. In a way, I think working with the kids was a better way of learning those skills then just coming in at the Grade 1 band level. I’m more than happy being behind the scenes, helping out, and not being the pipe major, as I’m doing with Toronto Police. I love working with kids, though, and working with a juvenile band can be more rewarding in some ways than playing in a Grade 1 band. A combination of the two would be great!